When it comes to landscaping your property, creating an indoor garden or just adding a new level of curb appeal, adding a palm tree can bring an entirely new personality to your space. Not only do palms add to the aesthetic qualities of your lawn, they can increase your properties value. If your yard is roasting in the open Florida sun, our palms can give your once sunny yard a refreshing shaded area under the canopy of some beautiful tropical plants. Aside from these benefits, every palm tree planted brings with it a host of environmental benefits, including cleaner air for you. The areca palm is one of the most popular indoor plants in the world, but also is a beautiful addition outdoors. We have areca palms for sale starting as low as $45 for a 15 gallon palm, up to $85 for a larger 25 gallonareca. The areca is a versatile tree that can tolerate a wider range of temperatures than many other varieties. It can survive some light frost and calls both subtropical and tropical climates its home. This species, known in Latin as Dypsis lutescens, is also referred to as the butterfly or golden cane palm. Native to Madagascar; it has since been spread around the world. The areca palm has earned the coveted Royal Horticultural Society’s Award of Garden Merit for its versatility, ease of careand decorative characteristics . How big do Areca Palms get? Multiple stems come from a cluster at the base of the plant which can eventually grow to heights that range between 20 and 40 feet. The leaves are long and arched, reaching lengths up to 9 feet on a full grown areca. The multiple leaves curve upwards, resembling a butterfly flapping its wings in the wind. 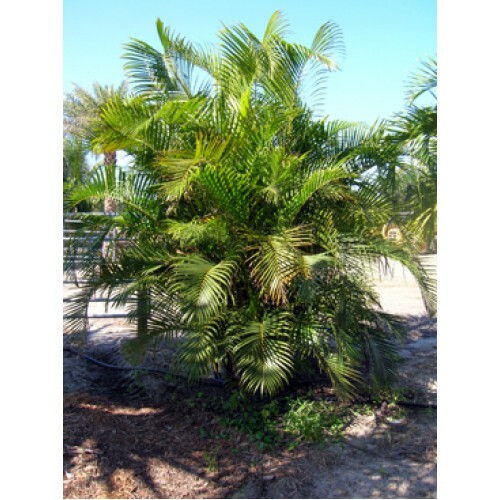 During the summer, you will notice attractive yellow flowerson a mature areca. We all know that plants help clean the air we breathe. Palms our no different. Research has shown that the areca palm filters some known chemicals out of the air such as toluene.\ - a compound that is known to cause human ailments ranging from fatigue to headaches when one is exposed for a prolonged period of time. When kept indoors, even a relatively small areca palm acts as a natural humidifier by transpiring a liter of water into the air eachday. At A Quality Plant, we have many varieties outside of arecas for sale including Washington Palms, Canary Palms and our Beautiful Bismark palms. We have palms for every space and price point, whether you have an indoor garden, a backyard patio or a boulevard in need some stunning shadetrees. Everyone, regardless of their horticultural skill can plant and maintain a healthy palm and we will gratefully assist you in whatever way we can. From being natural air filters to providing a substantial increase in your property's value, palm trees are loaded with benefits. Check out our selection in Ruskin, Florida and let us help you make your own personal tropical oasis.